E-trolZ's EPM064 Electrophysiological Monitor / Recorder / Analyzer is a powerful embedded module for medical device OEMs. With wide dynamic range inputs, high-precision adjustable gain amplification, built-in calibration and impedance test, and configurable bi/monopolar inputs, the EPM064 is ideally suited for all electrophysiological applications. The 64 configurable channels are digitized at a full 16 bits and at selectable sample rates up to 1 KHz. Through the use of plug-in SD cards and USB expansion devices, the EPM064 is highly configurable, immensely capable, and yet cost effective. By selecting the data storage capacity and wireless communications type to meet your application requirements, you select the exact functionality needed to meet your cost target. Furthermore, the EPM064 delivers exceptional portability based on its small size and stingy power consumption. The EPM064 is a fully integrated, ready to program, OEM solution. With the RTOS fully integrated from the hardware through the system and user I/O, up to an I/O API, the EPM064 is ready to program out of the box with standard C, C++, or C# tools. In fact, most of the application programming is already implemented in the E-TROLZ I/O API. This I/O API delivers fill-in-the-blank configuration of digitization parameters, over sampling routines, calibration functions, impedance functions, data file parameters, and communications parameters. Beyond monitoring and recording applications, the EPM064 has the power to analyze the digitized data in real-time. With an on-board 32-bit DSP, advanced data analysis delivers immediate and possibly life saving information to the patient, service provider, or eHealth network. The EPM064 embodies the most advanced E-TROLZ technology. The Dual-Partition TriCore Architecture, DPTCAT guarantees reliable, repeatable performance for easy FDA approval. The DPTCA™ is a dual partitioned architecture with three processors designed to deliver reliable, real-time performance simultaneously with feature rich data management. 5 Degrees of Integration is the culmination of expertise in real-time measurement and control, signal conditioning, signal processing, and software integrated and delivered into each product. 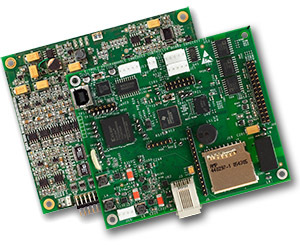 The OMAP™ is a dual-core, high-performance, power efficient processor, providing real-time signal processing capabilities of a DSP coupled with the command and control functionality of an ARM. The E-trolZ Control Coprocessor is a dedicated, programmable, real-time controller capable of sophisticated timing, signaling, and high-speed I/O control. The E-trolZ IDE delivers powerful control routines in an easy to use, integrated environment. For those demanding visual and communications rich applications, Windows CE enables features such as video and audio playback, encryption, browsing, web serving, and network device management.